I note that the title of the thread is "1949 Taliesin Origami Chair." It has come to my attention that American designer Paul McCobb produced a design for a molded fiberglass chair in 1960, a design he called Faceted Form Chair. It seems that others have called this chair "Origami." It does not resemble Wright's design. 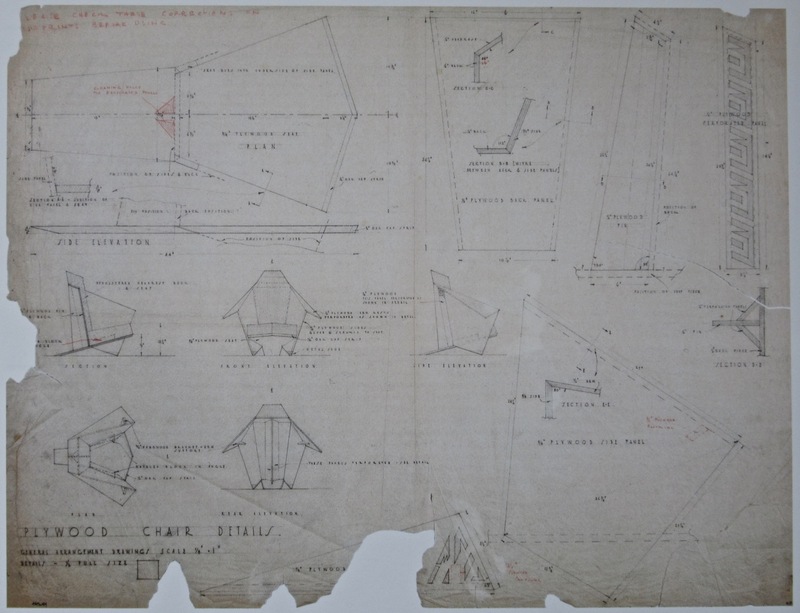 I find that I have no information on the history of Wright's chair as to date of original design and, more particularly, the date when the word Origami was first applied to the design. Can anyone provide facts ? FYI I found digital versions of Jack Howe's variation on the University of Minnesota digitized collection. Both have links to high resolution versions of the images, with legible dimensions and angle measurements. Thank you, Owen ! At last. And very definitely from the Horse's Mouth, as it were -- not an apprentice or third party more removed from the center of action. And the name Butterfly Chair -- I had forgotten that term completely. So, who called it what, and when, becomes a question to be answered. Origami vs Butterfly: here we go . . .
indicated, and then removed, the "tail" to the (original) seat plane; note that he adjusts the seat angle with an extra panel just under the foam. were taken from a built example -- but we don't know which one. 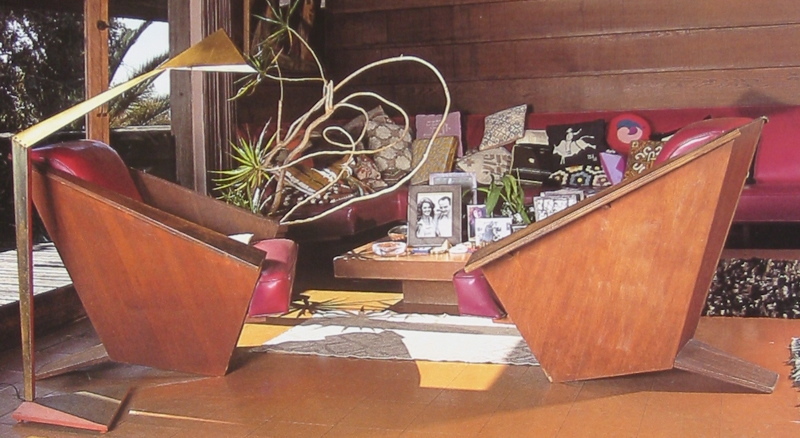 made for the Sturges residence, presumably drawn by John Lautner. See p 3 of this thread. Bringing back the 1949 Taliesin Origami Chair thread post-outage. I would really like to build a more representative version of this beautiful chair. 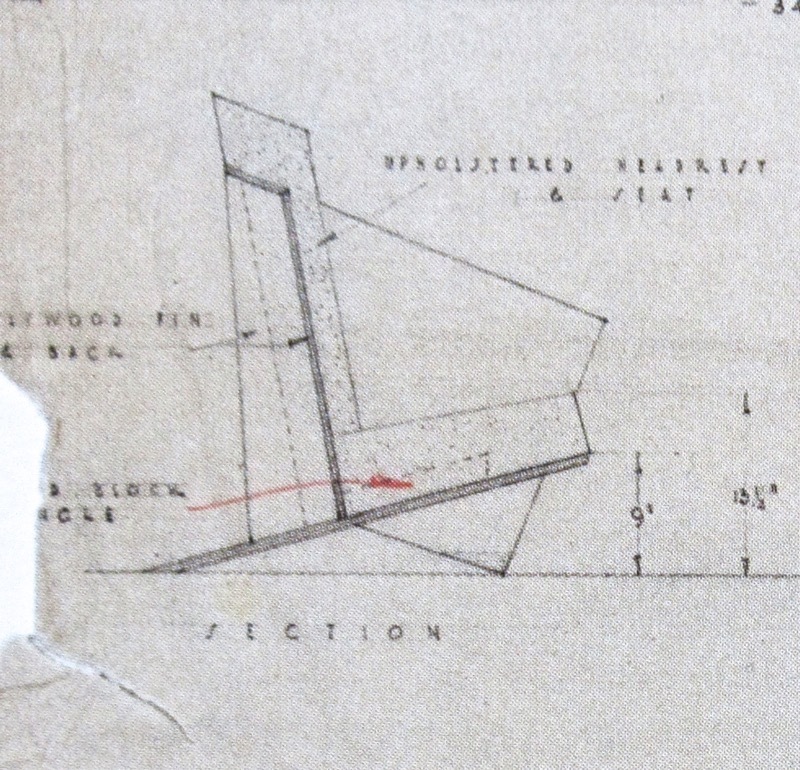 It was mentioned early on in this thread that the archives won't provide the 1946 stand alone plans for this chair, to probably prevent people from making the chair themselves, and to protect Copeland (at the time) and now Cassina. 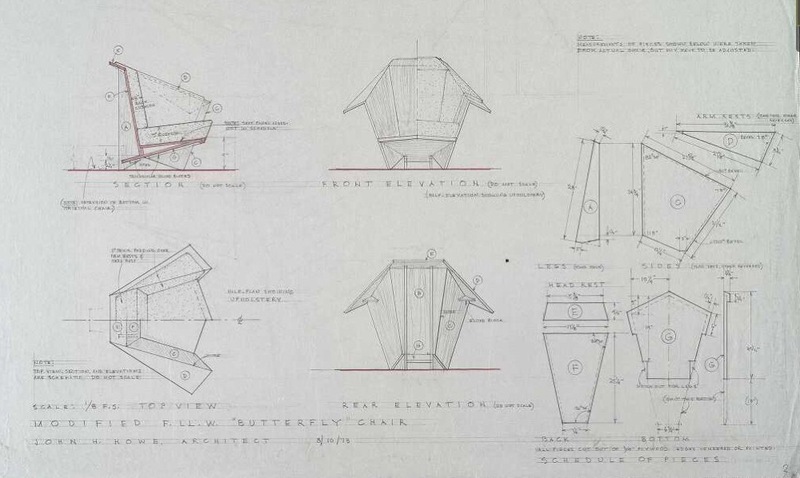 However, I have read that a design for the origami chair was included in the Stromquist residence plans, and wonder if anyone has gone to the effort to get a copy of those plans from the archives, and if so, did it include the chair design in those plans? house, Canton, OH, 1952. 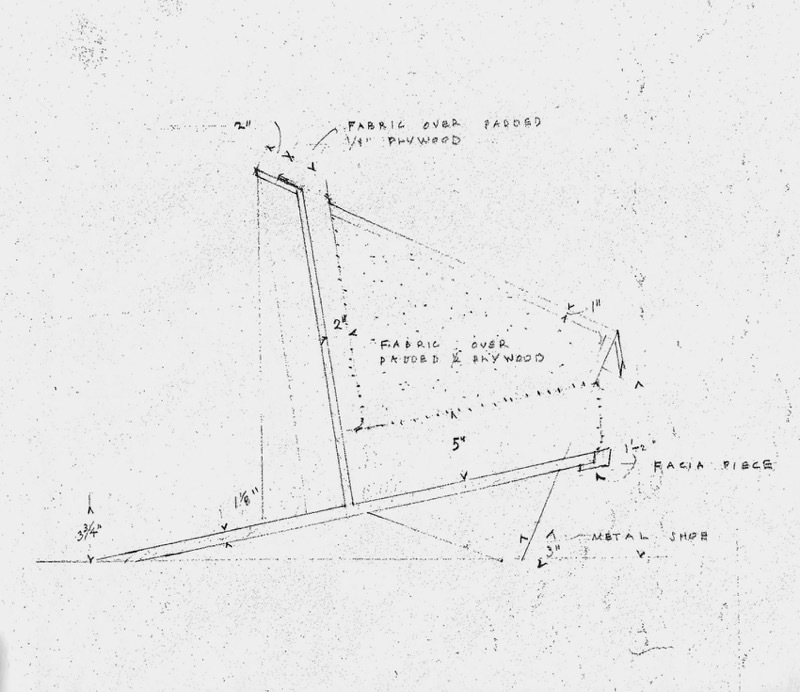 Virtually all of the dimensions on the drawing are visible, though the reproduction measures only 6 1/2" x 8 1/4". chair, from one drawing to another, including in the way the chair meets the floor, the detailing of the spine, and the width and angle of the arms. as well. The photographs here, and elsewhere, will be useful in making the initial selection as to the particular version of the chair you would like to own. bdey01 should be directed to the links in owenCollins's post, above, for Jack Howe's version of the chair. I acquired the Jack Howe prints years ago, and due to some other events in my life, never got around to building my own version of the chair using these. However, the time has become available to restart my woodworking hobby, and a pair of these chairs along with a Lewis coffee table are in the works. I have found the plans from '73 to be favorable, whereas the '86 plans look a little off to me. Anyway, how readable are the plans from the Taschen book? I hesitated in purchasing these books when they arrived a few years ago as I spent my FLLW book allowance for the decade when I acquired a set of the monographs a few years back (a deal I thought at $2500, but the wife still didn't like! ), and don't know if the cost for a single page of plans is worth it. If someone could post a high quality image or a emailable version, that would be great! 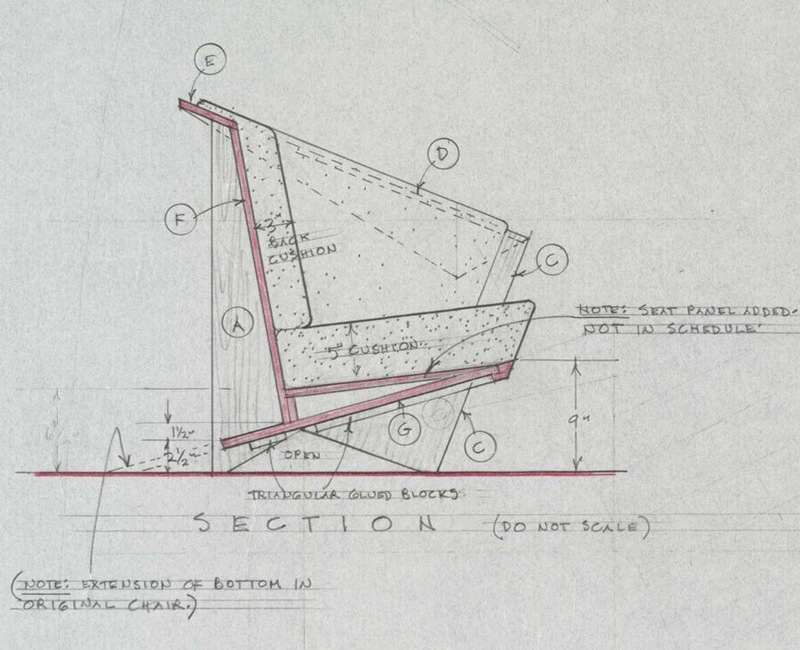 Otherwise, is the '73 plans of Howe close to the dimensions that the chairs at Taliesin West have? Just sat in those again recently on a business trip to Phoenix, and they fit like a glove. Other than the materials, angle to the back, and the cushion thickness, what other changes do folks here think were made to the design that the Cassina people made? 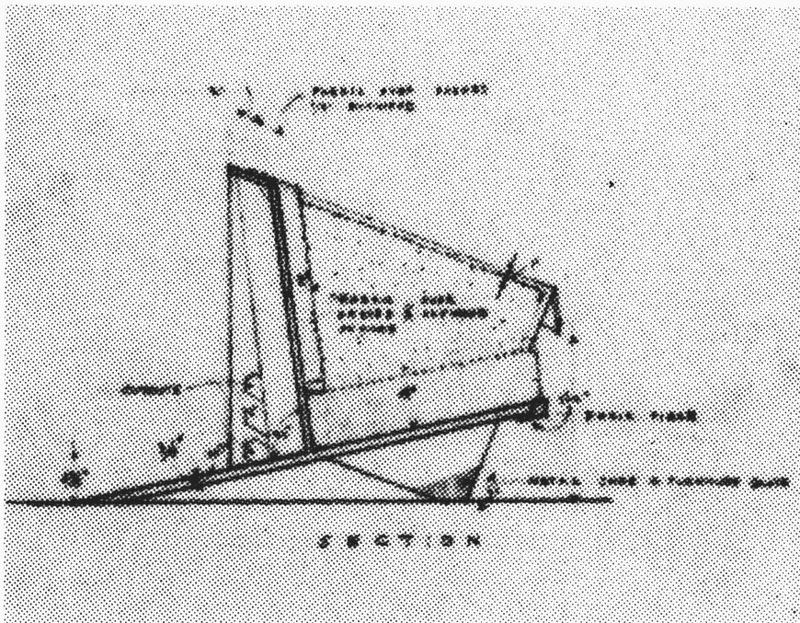 Howe's plan from '73 shows the raised cushion bottom so as to get the angle between the back and cushion just over 90 degrees, but by how much? 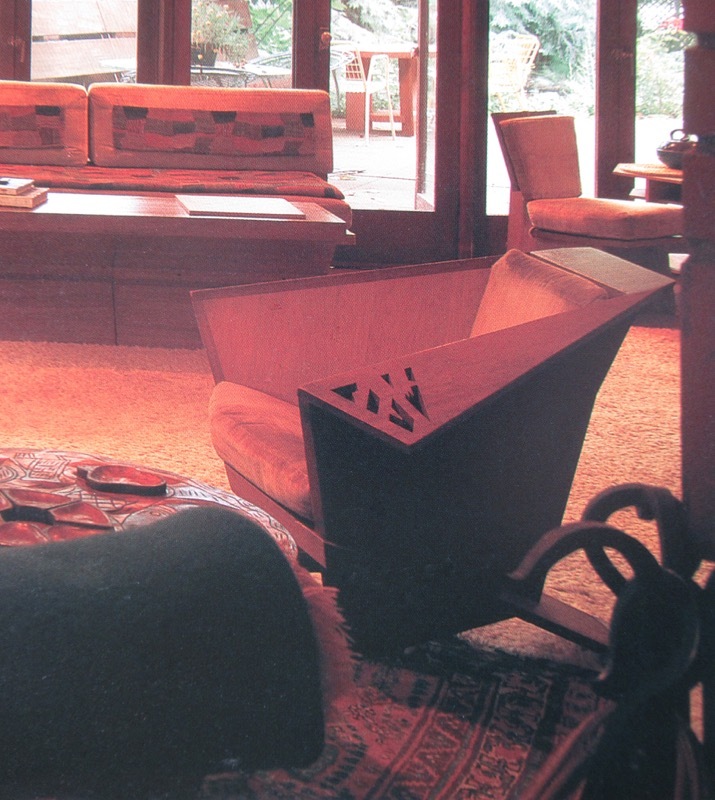 Did the original Taliesin West chairs have the cushion support raised as well? Were these new Cassina chairs modeled after the Howe design? Or something else entirely new? Finally, does anyone know the answer to my question about the Stromquist residence plans? Specifically, do they have the chair design in the plans, and if so, will the Foundation provide a copy to a requestor like me? Here's the chair drawing published in Taschen, Taliesin no. 4612.044, at larger than published size. I have also photographed the four quadrants of the sheet, for those interested. My e-mail address is linked below. clearly not the case with the built chair. The seat-to-back angle is a rigid 90º; one sitting in the chair as drawn might experience an even more acute angle. 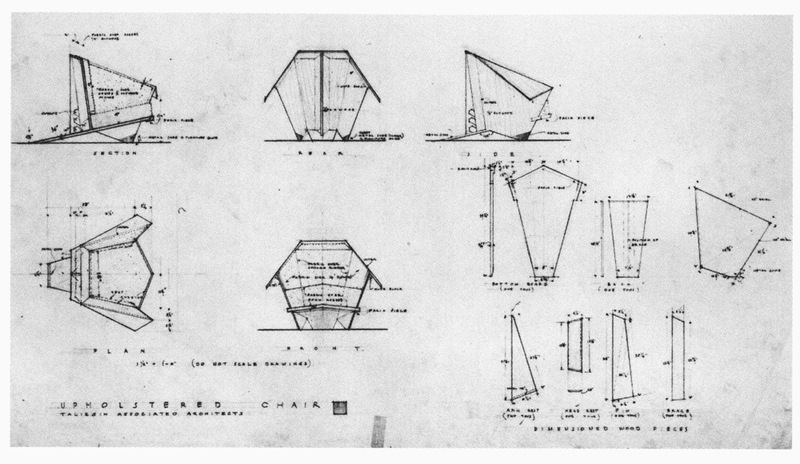 More drawings -- first, the Howe drawing at the University of Minnesota, then a similar sheet, from Taliesin Associated Architects. I do not recall where this second drawing was published. A note on the Howe drawing cautions that the views are "schematic" and should not be scaled. Howe dispenses with the "tail," and wraps padded upholstery over the arms. tapered seat cushion material could be used. antipathy toward seating as an activity, and a consequent or parallel misunderstanding of what seated comfort requires ? chair, and modifies the plan shape of the seat while providing voluptuous back upholstery, apparently in smooth Naugahyde or the like. that gratifying "Aaah . . ." that is music to the furniture-maker's ears . . .
back should increase as the seat is tilted back more, on a continuous scale, ceases to operate when the seat angle is severe enough. reached, the mind/body begins to crave a bit more back support, even at the expense of bending further at the waist ?